Heavy metal monsters Lordi have been hailed as heroes in their home country after scoring Finland's first ever Eurovision Song Contest victory. President Tarja Halonen congratulated the band in a telegram after their song Hard Rock Hallelujah won in Athens. Hundreds of people celebrated in the streets of Helsinki, honking car horns, waving flags and singing Lordi's song. Finnish newspaper Helsingin Sanomat proclaimed: "It's official: Hell has frozen over. Finland has won." The band won the Eurovision public vote after singing their heavy rock anthem dressed in horror costumes and accompanied by pyrotechnics. Many people in Finland had feared Lordi would flop and damage the country's reputation. But they have now become national icons and Culture Minister Tanja Karpela said Lordi's victory proved Finnish music could be successful abroad. One fan, Erkki Turunen, said Finland won "because it put on a genuine show". "This wasn't some sort of rubbish. This was really cool," he said. Another person on the Helsinki streets, Nina Laisi, said: "I don't claim to be a rock fan, and it's not my favourite music, but I admire these guys." Helsingin Sanomat wrote: "Years of humiliation, frustration, and 'zero points' were wiped away as the Finnish entry blew everyone off the stage in Athens. "When the United Kingdom voters gave Finland 12 points, one knew somehow that nothing would ever be quite the same again." The Finnish Broadcasting Company (YLE) said Lordi returned from Athens on Sunday and would meet the press on Monday. But TV cameras will not be admitted because the band do not allow themselves to be filmed without their monster outfits. They will stage a public celebration in Helsinki on Friday. Prime Minister Matti Vanhanen said the government would help finance the contest when it comes to Finland next year. "There are quite a few of us listeners of heavy and rock music, and for once there was the possibility to vote for a piece that differed from the general Eurovision line," he said. 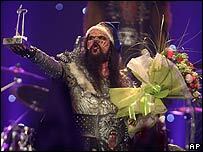 Lordi amassed 292 points in the public vote - 44 ahead of Russia's Dima Bilan. But UK rapper Daz Sampson could only manage to come 19th out of 24 countries with his song Teenage Life. "There were some very good songs in it this year," he said. "I thought mine was one of them - obviously Europe didn't agree." The contest attracted an average of 8.2 million viewers in the UK on BBC One on Saturday, according to unofficial overnight figures.